Hey all, I just wanted to give you a quick heads up that something has come up in my life that is going to take me away from being able to blog for a while. I'm not sure how long it might be, hopefully it turns out being pretty short, but right now I have no idea. I'm sure I'll let you guys know more about all of it when I know the full outcome and can look back on this time of uncertainty. I've been making notes and think that I can produce some good stuff out of this later on. But until I can get there are a few things that you can do for me. 1) Sign up to get notified of posts here so that you will know when I'm back in the game. 3) Click on any and ever add you see just for the heck of it. 4) Pray for my family. Today was a big milestone for me. 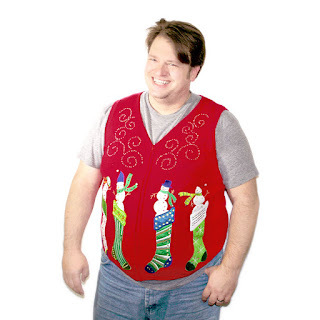 I’ve been vested! So I thought that I would discuss it a bit and what all it means. First let’s start by talking about a company match, typically thought of as free money. Some employers, as part of their benefits package, match part of their employee’s retirement account contributions. Like any other benefit, part of the rationale behind the company match is to entice people to want to work for the employer. People are attracted to employers with good benefits packages. Also, employers receive a tax benefit for contributing to employee 401(k) accounts. A company match has the power to greatly increase the value of an employer-sponsored retirement savings account and I beg you to take advantage of it if your company offers one. There is a wide range of company match levels. A typical matching situation is: the employer matches 50% of employee contributions for the first 6%-of-salary that an employee contributes – so the company will not match more than 3% of the employees’ salary. Some companies will provide a straight match, up to a certain limit – rather than matching 50% of employee contributions, they will match 100% of employee contributions up to a set percentage-of-employee-income. A few companies will provide a dollar-for-dollar match on all contributions by an employee, though it is rare and if you ever find this you better make sure to count your luck stars and max out your 401(k) every year no matter what cause that’s a free $18k per year. Under those circumstances, the company match would be limited only because the employee contribution is limited. Our company policy is that the portion that they match will get automatically invested into their company stock, then you can go have it moved out when you want. Since my company’s stock has been performing nicely and the future looks promising I have been waiting to sell out until after I’m fully vested. So between the company match and the growth that that investment has seen I’ve received $11,740 from them over the past 3 year, that’s roughly $3,913 of freeeeee money each year. Now that we understand the company match, we can discuss vesting. Vesting refers to the practice of delaying an employee’s ownership of the company match (or any other company contribution, like profit-sharing) for a specified number of years. So a company match contribution to a 401(k) plan will grow as part of the overall account value, but the employee could not rollover or take distributions on any portion of company match money that is not vested, or owned by that employee. So, if I had decided to quit my job yesterday I would have only been able to keep 50% of company match that they had given me over the years. But now that I have completed my 3 years of servitude I can walk out at any time and keep all of that match in my 401(k). And now that I’ve reached my 100% vested milestone? I think I’m going to go start looking for another job that I might actually enjoy doing! So, how'd we do in April? I am a bit obsessive but I actually track my net worth every morning that I work, just because I love seeing the graph it makes and knowing what's going on, and it only takes me about 10 minutes using Personal Capital if I go slowly and analyze anything (if you’re not already using Personal Capital I highly suggest checking them out. They are 100% free and I love them and use their android app nearly every day). But over the past month our net worth has increased from $212,959.97 to $216,882.83, growing by a total of $3,922.86 for April. In April we started with $132,328.26, invested $1,143.69 and ended the month with $135,362.96. Meaning that, in April, we gained $1,891.34 on our investments. This year I added another metric to track on this. In April we spent a total of $2,523.76 which means that, this month, we could not have lived off of our investment income. Current ER* date is being calculated out at 5/11/2033 (5,854 days left!!!!!!). I'm not going to go into the details behind the calculations on this one since it's more lengthy but you can read more about it in my post about Our Current Financial Plan. But after all of our income, expenses and planned savings for the month we ended up with an extra $800.93 in our checking account to use for investing in our future. We have actually made one small change from our previously stated plan and instead on dividing this 50/50 between our mortgage and Vanguard we have begun dividing it into 4 buckets, adding 2 more buckets for remodels and vacation as follows: Vanguard = 30%, Mortgage = 30%, Remodels = 30%, Vacations = 10%. So this time we invested $240.28 in our Vanguard mutual fund VTSAX. Then I called up my bank and scheduled a payment for an additional $240.28 to go to the principle on our mortgage. So after our regular mortgage payment that automatically pays on the 1st of each month and this extra payment our mortgage dropped down to $100,871.77 today. Which means that, as of today, we actually own 42.03% (roughly 790.12 sq. ft.) of our home. We bought 10 sq. ft. this month! So, by and large our April turned out pretty good. How did things go for you? And here's to having a great May ahead of us. We all know that cold cereal is an expensive breakfast option. But the problem is that it’s just so quick and easy. All through college I made oatmeal for breakfast basically everyday (occasionally pancakes on special occasions), but never splurged on cold cereal. But for the past 3 years I’ve slipped into complacency and I’ve turned a bowl of cereal into a morning ritual. Why? You know how expensive it is! Three years ago I started a job that required me to be out the door by 6:30 every morning. I am not a morning person. My alarm is set for 5:40 and it takes me at least 4 snoozes and 20 minutes to get vertical. It’s a good day if I can drag myself out of bed by 6:00 am. This leaves my with very little time to bother with breakfast. So, since I don’t have the time to cook myself a plate of oatmeal I opt for a much easier bowl of cornflakes (yes, my family eats oatmeal off of a plate since it cools faster and can be eaten sooner than if it’s in a bowl). Then when my family meanders out of bed they make a batch of oatmeal. In college I once calculated that we could eat a plate of oatmeal for under $0.10 per plate. And that included the milk and sugar. Now that I have to pay a bit more for our 50 lb. bags of oatmeal and my family’s apatite seems to be growing I’ve calculated that an average plate of oatmeal costs between $0.20 and $0.25. Cereal – I bought and ate nothing but Corn Flakes and Frosted Flakes from Aldi. An 18 oz. box of Corn flakes was $1.49 (8.3 cents per oz.) and a 16 oz. box of frosted Flakes was $1.29 (8.0 cents per oz.). I love Frosted Flakes but they are too sweet for me now that I’m older than 8. So I would mix the two. A typical bowl was about 75% Corn Flakes and 25% Frosted Flakes. I found that I was having to buy a box of each and a gallon of milk about once a week. After adding in the cost of the milk ($1.19-$2.00 per gallon depending on the week) I determined that I was spending about $0.90 per breakfast and my wonderful wife loved to point out that nearly all of the limited nutritional value from it came from the milk. I got to thinking about these calculations the other day and realized that I was the grocery budget culprit. I have been doubling the cost of our family’s breakfast for the past 3 years. This thought has been in the back of my mind for years but I wasn’t sure what to do about it. I didn’t have the time to cook a breakfast and couldn’t figure out a cheaper and faster alternative to cold cereal so I just put up with it. Until yesterday when inspiration struck me. Over the Eater week Aldi had eggs on sale for $0.39 per dozen so my wife loaded up with 6 dozen eggs. 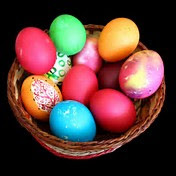 We hardboiled and died at least 2-3 dozen eggs with the boys and have been snacking on colorful eggs for the past two weeks. I’ve never really loved hardboiled eggs but since I’ve been running and working out much more than normal lately I can tell that my body has needed more protein than our semi-vegetarian diet was providing, so I ate them. While 39 cents was an amazing deal on eggs we can usually get them for 99 cents or less. So I figured that this meant that I could eat 10 hardboiled eggs for breakfast for less than the cost of a bowl of cereal (and it’s got to be better for my body). I didn’t have any idea how many eggs it would take to sustain me till lunch but I tested it out this morning and here were the results. I made 6 eggs last night before bed. Ate one before leaving the house then kept the rest on hand at work and ate one about every hour for the first 3 hours of the day. It was good to be able to space out my meals a bit and have a series of smaller snacks to boost me along rather than having one meal early on then starving by 10:00 without an option for something to eat until lunch. And it only cost me$0.33 tops. Going forward I think that I’ll still plan on trying to have 6 eggs on hand incase 4 happens to not be enough some mornings. But I’m pretty excited about this new discovery I made. (And I’m sure I can learn to enjoy them at that cost). What do you eat for breakfast and about how much does it cost? 1. Put eggs in a pot of tap water. 2. Put the pot on the stove on high heat. 3. When the water starts to boil turn off the heat. 4. Let sit for 10 minutes. 5. Drain the hot water and fill the pot (with the eggs still in it) with cold water. 6. Wait a few minutes then remove the eggs and refrigerate. 7. When you’re ready to eat it just crack it and peal it. Easy right! Just doubled my list of meals I can make! I try not to clutter up my phone with a ton of apps. In the past I’ve rotated through several financial apps but most of them were eventually deleted because I found that I didn’t use them and they were just taking up space on my phone. So, while this app list might not be very long, you can be assured that they are good ones that I consistently rely on. 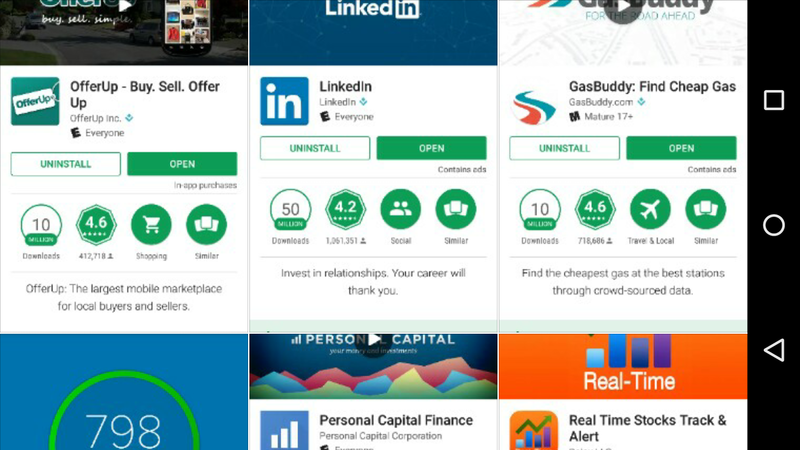 Also note that these are all free apps, I’ve never paid for an app and don’t plan on it in the future, so I’m not trying to sell you anything. 1. 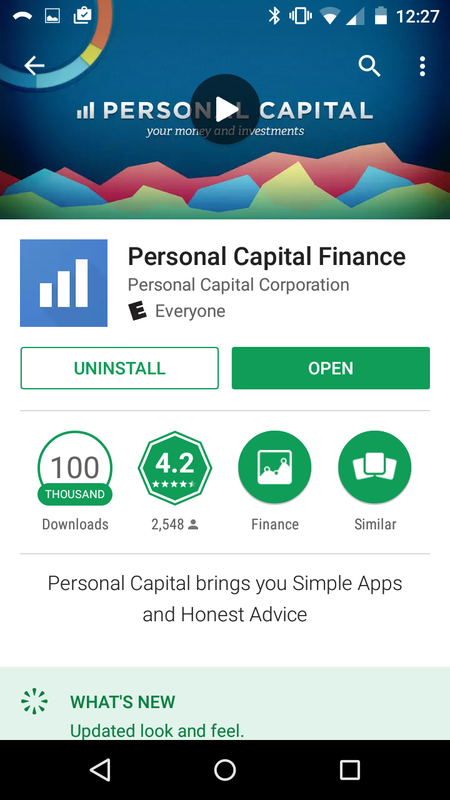 “Personal Capital” – I use this app first thing when I get to work every morning. It is so convenient to be able to open an app, type in a PIN, and have instant access to see all of the movements that have been happening on all of our accounts. Since I track our net worth daily, I rely on the front page of Personal Capital for all of my account balances. If there has been and changes in my savings, checking, or credit card balances I can click on that account and see the detailed history behind it to verify that I know what each purchase was for and that there aren’t any surprises or fraudulent activities. This habit has actually allowed me to catch a fraudulent credit card charge just a few hours after it was made and before it had left the pending status. And if you don’t have a Personal Capital account I strongly suggest getting one, it’s free, safe, and an absolute personal finance game changer. 2. 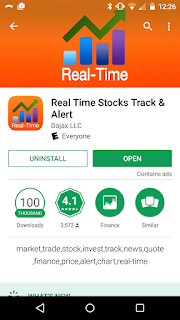 “Real Time Stocks Track & Alert” – There are several free apps out there that will give you real time access to the movements in the stock market. I stumbled upon this one after only trying out a few and it has stuck. I know that it offers a lot more functions than I care to use but I haven’t bothered digging into it too much yet, maybe someday. What I like about this app – it makes it so simple to save a few of the stocks that I care about the most and quickly monitor how they are doing throughout the day. By selecting the stock I can dig a bit deeper into its past performance and even see the discussions that others are having about it that often give better insight for why it is performing the way it is that day. 3. 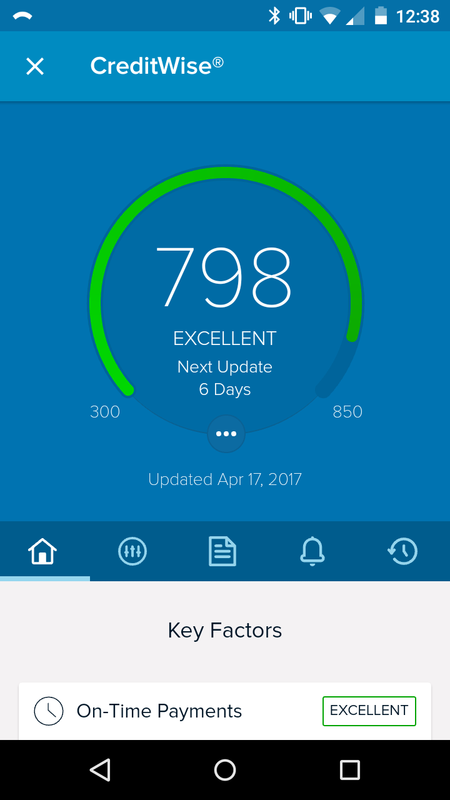 My credit card provider – I have this app so that I can monitor credit card activity, pay my monthly bill (on time and in full as soon as it’s posted so that I never have to worry about interest fees), and use their credit monitor feature. 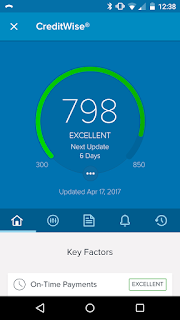 They provide me with a free weekly update of my TransUnion score so I make sure to keep an eye on this number every Monday morning. I would strongly suggest having your credit card provider’s app, whoever it may be. 4. My bank – If your bank has an app please download it. I have two banks. One is a large nationwide bank that we’ve used for years and do the majority of our banking through. But their closest physical location is almost 2 hours away from where we now live so I have to do all of my banking online. So having their app makes banking so much quicker and easier, and it’s the only way I could deposit checks with them. Our other bank is a local credit union that holds our mortgage and I hate that they don’t have an app and make me log into their website to see my balances (and they don’t sync to personal capital) and call or stop in to make any transfers/mortgage payments. 5. 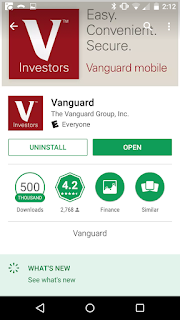 Vanguard – I use this one since all of my taxable investing is done at Vanguard. 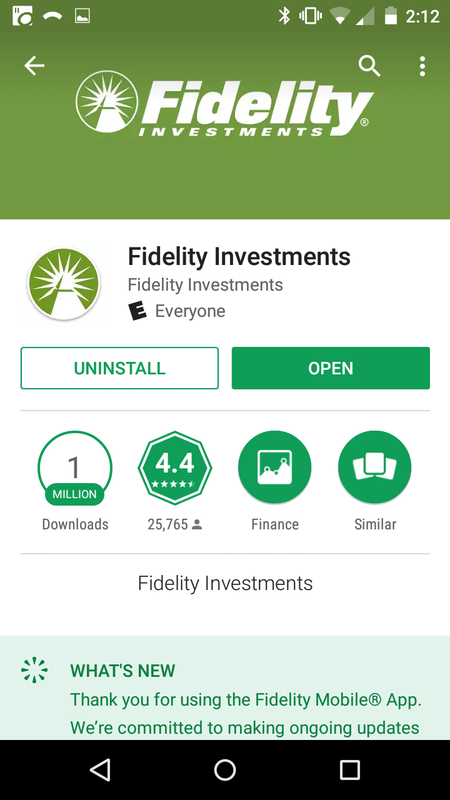 The main features that I use on the app is to buy shares of my mutual funds on the 1st of each month and see what my performance rates have been for each of my funds periodically. 6. 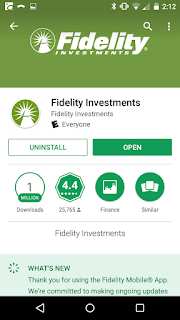 Fidelity – I have this one since my 401(k) is administered by Fidelity. I actually don’t use it very often but keep it around since it’s easier than logging in online if I do need to see something in my 401(k) or HSA accounts. 7. 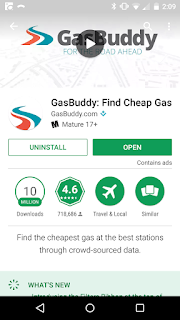 GasBuddy – I use this often to see where the cheapest gas is. Since my gas gauge and odometer don’t work in my car I have no way of knowing how much gas I have at any given time. So my solution is to only really drive it to work and back and fill up on my way home every Friday. I’ve found that in a week I use about ¾ of a tank so it’s never been a problem to do this. I have to commute about 25 miles so the gas prices often differ widely along the way. So to make sure that I know which gas station I should be going to I always check Gas Buddy before leaving work on Friday. I can pull up a map and easily see the current prices all along my route home. 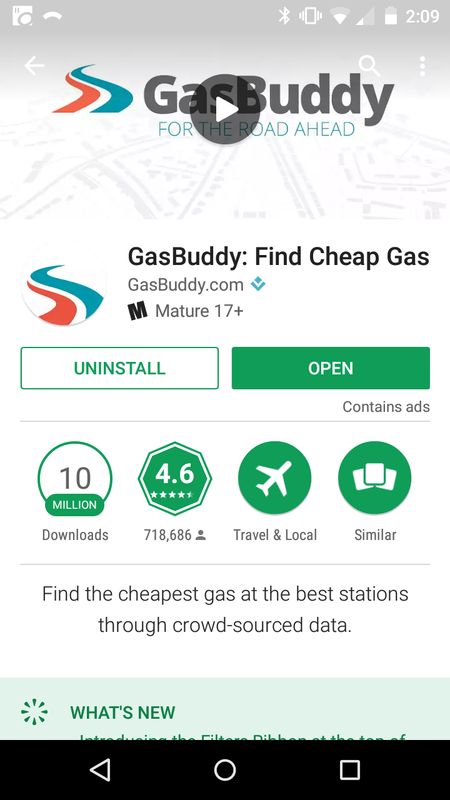 There is no way to quantify how much this app has saved me but I would guess that it easily saves my an average of $0.75 per tank – so roughly $40 per year? 8. OverDrive – Ok, so it’s not a financial app. But it has saved me a lot and helped my finances out since I use it to listen to finance (and other) books while I’m at work, in the car, or out running. It’s so nice to have access to all this information without ever having to pay for it. 9. 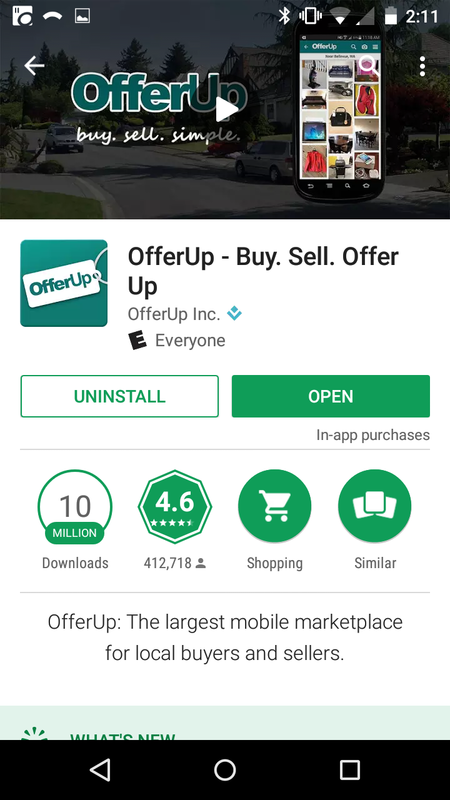 OfferUp – I’ve tried using Craigslist to sell stuff but I can’t stand all the hoops you have to jump through to list something on it. While OfferUp doesn’t get near the amount of traffic that Craigslist does, I use it because it is so easy to list something on it. 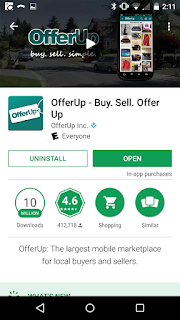 And, while Craigslist posts expire and thus require constant maintenance if something doesn’t sell quickly, OfferUp posts stay up until you remove the post. There are some things that I get contacted about here and there that I put up for sell several months ago and haven’t had to do any post maintenance. Contacting people to ask questions and make offers on their goods is all done inside the app and very easy. I’ve made $90 off it so far but don’t really put any effort into it. 10. LinkedIn – I really don’t like social media, but in the professional world we live in LinkedIn is a must unfortunately. 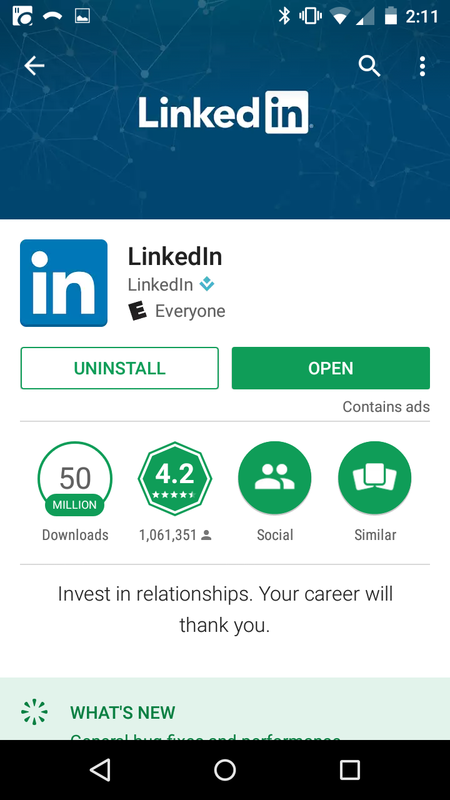 I actually don’t use this app very often but keep it because I would never know about and LinkedIn notifications or messages without it since I never think to actually log in online. 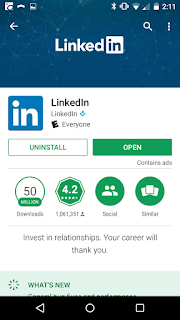 Now that I’ve started looking for a new job once again I try to open up the app at least once a week just to explore and connect with people that might be able to aide me in finding new employment. 11. Digit – I actually deleted this one this week since I closed my account after they released their news that they are going to start charging a monthly fee L. But for a year they lived on my home screen and I interacted with them regularly so I thought that I might as well mention them.